Since the bus ride to the Safata district is roughly 2 hours long because the bus is slow and the path meanders around the island, there’s a customary stop at a faleoloa either leaving Apia or rolling into Safata. I like to use this stop to pick up a bottle of coke and a couple bags of chips for Akanese and Keleme. So yesterday our bus rolls into a faleoloa on the south side of the island. I’ve been standing in the back the entire way, so many people get off before me. I make my way to the back of the store and pull a coke from the bottom shelf. For whatever reason, the bottle slips from my hands and falls to the floor. Rather than simply shattering, the coke bottle—with all of that compressed carbonation inside—essentially explodes. The store goes silent. The shopkeeper’s eyes are on me, as are the other 140 eyes that just got off the bus. I get a few cuts from projectile shards, but mostly I want to dig a hole and hide in it. I am one of the last to get back on the bus, and as I climb the steps the driver released the parking break. The bus lurches forward, and 140 eyes that just saw me explode a bottle of coke see me fall from the bus’s sudden motion. A woman tsks and says pitfully, “Kalofai.” Poor boy. 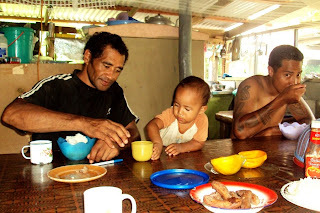 Phil’s host sister Tuese just had a baby, and I’d heard she named it Filipo—after Phil. 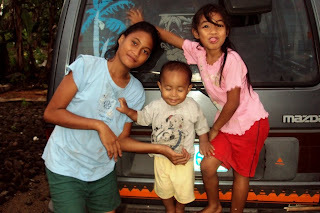 This was my first time back in the village since the kid was born, and my family piles in the van to go see the baby. “Mati!” She yells, claiming the baby is named after me. This surprises me and I tell her she’s lying. “Filipo! Isaac!” She claims. I stare quizzically. “Leai se mea.” She laughs. He has no name. The kid turns 3 weeks old tomorrow. I’m pretty sure his name is Filipo. Asolima’s nephew, Malo, has moved back to Fausaga after his job at the Samoa Packing plant in American Samoa shut down and he was laid off. He and Oge leave the house before I wake up this morning, and while I ask Mele about hemming my ’ie, Malo walks up and dumps a pile of dead coral on the ground. He looks at me. “Fia o i le sami?” Do you want to go to the beach with me? I have no swim trunks, but Asolima is quick to bring me a pair. She hands me a t-shirt, which I decline. My mistake. We wade into the marsh and walk through 300 yards of waist-high mud to get to the beach. Oge meets us there. We fill 5 gunny sacks with rocks—as it turns out, we’re re-paving the driveway. Oge hands me a sack to carry, which must way upwards of 70 pounds. Ha. I’m able to carry the thing, but my shoulder is quietly sobbing. Luckily, the plan is only to carry the sacks out to the small outrigger canoe, which is on the near side of the 300 yards. When we finish carting the 5 sacks, Oge and Malo and I bathe together in the community pool. Fun times. I hope you’re well. Village pictures below. Tuese, Keleme, and the nameless baby. This is the home of the family that owns Sina PJ. 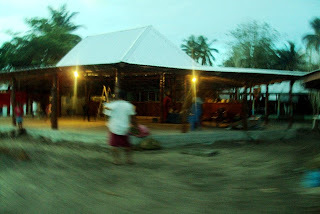 A lot of the buildings in Tafitoala tai are still standing. Oge, Keleme, and Malo at the kitchen table. Matt -- I really enjoy your blog. 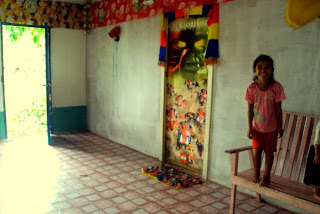 My PCV host family ten years ago was in Tafitoala, so I really appreciate knowing that it's not completely gone. It was such an awesome village. Thanks for including a picture from there. 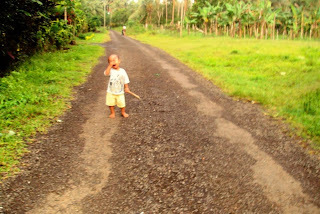 Picture of the baby crying on the road is so.......pricless, the green plantation makes me homesick. Yes, good times. Yes, kalofae ia oe, Matt, and she really meant it. Talofae, also means their hearts go out to you. My heart goes out to you, and getting the dig a hole in the ground comment. did I miss something?? what happened to Halloween? what did you end up being for Halloween?